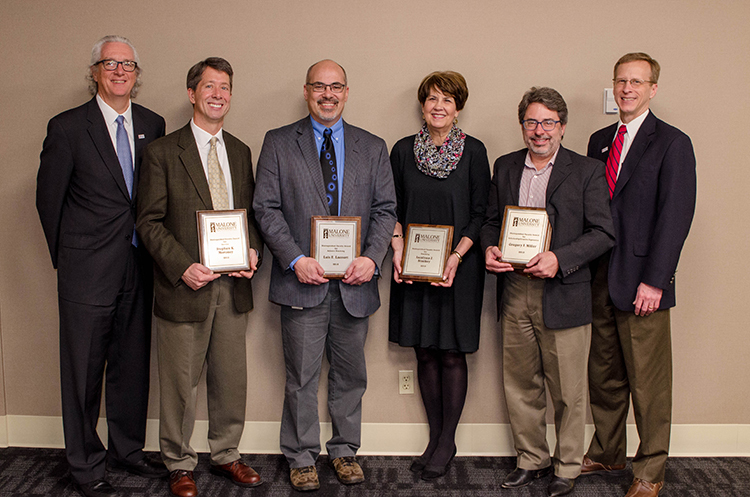 Each year, four faculty members are honored for their commitments to teaching, service, scholarship/creative expression, and adjunct teaching, per nomination by students, faculty, and administration. Steve has been a fantastic member of the Malone community for 25 years. He is well-loved by his students, who greatly appreciate his thoughtfulness in teaching and his gentle spirit. He is a great encourager. Steve is able to teach theology in a way that clearly explains different approaches, yet students are often frustrated because they don't know where STEVE stands on the issue. This shows the great objectivity he has in presenting the strengths and weaknesses of various theological positions. It helps students to develop critical thinking skills and learn to think for themselves. Steve also serves as pastor at his church, and his pastoral skills are evident in the way he cares for his students by praying with and for them. Steve has served Malone faithfully and diligently for several decades. Specifically, he has been consistent in leading the noon prayer group for many years. He has led the faith integration seminar for many years. He chaired the department of theology... He served on the search committee to find our current provost, and he served diligently on the sexuality task force... . Steve has served Malone very well and done so with integrity, class, and humility. Dr. Stuckey is a wonderful instructor. Her talent for drawing in students and making learned material easy for students to relate to and learn is unparalleled. Dr. Stuckey uses great visual aids during her lectures but also includes students in discussion points. Her level of knowledge is amazing. As an educator, one thing she does that provokes thought is asking students what they think of certain questions and topics. By asking a question back to the class, Dr. Stuckey engages all students and gives the class opportunities to learn independently while also having an expert in class to monitor discussions. She makes her classes exciting, open, and faith-based. She breathes life into history in a way that could change anyone's mind about the importance or meaning of history, even if the student has previously found history to be lifeless and boring. However, she never gets so focused on her subject area that she forgets to relate history to practical living and especially faith. She emphasizes the interplay of faith and history so that one leaves her classes with an extremely well-rounded view of the events and time periods she covers. Her focus on discussion as a tool to help students draw clarity from the opinions and discoveries of others facilitates a community environment. Dr. Stuckey schedules a "field trip" of sorts in many of her classes. In her classes, I have been to the Ohio Statehouse in Columbus, the First Ladies' Museum here in Canton, and will attend an upcoming meeting with the mayor of Canton as well as the Housing Authority later this semester. This sort of experiential learning has gone far and beyond in helping me understand the concepts she teaches, and it is something I can only hope to emulate as a future educator. Dr. Stuckey is an excellent adviser and is devoted to her students. She gives her all to the university and has done an amazing job highlighting its history, as well as explaining the importance of Malone's roots creatively in each class she teaches. As one of her advisees, I have received so much support from her in both making sure I can take on two majors and two minors with an Honors thesis, and in sitting down to discussions about my life decisions when I needed a confidant. Dr. Greg Miller is extremely passionate about teaching. He creates an awesome environment to learn. His wealth of knowledge inspires me to work harder and learn better. Dr. Miller is passionate and driven. Not only does he ensure a wonderful education, but he acts as a role model to all, and truly becomes an influential part of students' lives. Dr. Miller has helped me grow in and out of the classroom, as he is also very willing to meet with his students to help further their understanding of the materials being taught in class. Professor Lacourt is an outstanding example of excellence in teaching. I have been thoroughly impressed by all of the faculty, both full-time and adjunct, involved in Malone's Graduate Counseling Programs. The fact that Professor Lacourt stands out in particular is therefore all the more significant. I know that I am not alone, among students, in being a little intimidated by online courses, but Professor Lacourt has come alongside us each step of the way. He has drawn on his own experiences to help us integrate our faith into the subject of Research and Program Evaluation, and has facilitated meaningful reflection through our weekly online discussion forums that encourage application to our future field of counseling. He has been one of the most approachable professors I have had, sending weekly updates for the course to help us stay on track, making himself available for online office hours, and providing timely and thorough feedback to help us prepare for the final paper. He has accomplished all of this, in addition to working as a school counselor, and working toward his doctorate. Even though going deep into the statistical analyses of research is a daunting task, his enthusiasm and genuine interest in the success of each student is truly admirable, and I am so grateful for that. The high school where he works (Perry) has been through so much recently, but Professor Lacourt has been able to transform his own grief into authentically guiding others toward the hope we can find in God.